Suitable for both KS1 and KS2, this workshop will help you fulfil your SMSC educational requirements, and provide an excellent springboard for further work and discussion. Content: Since 2014 schools have had a requirement to promote British Values. This forum-theatre style workshop is an excellent way to help you do exactly this. 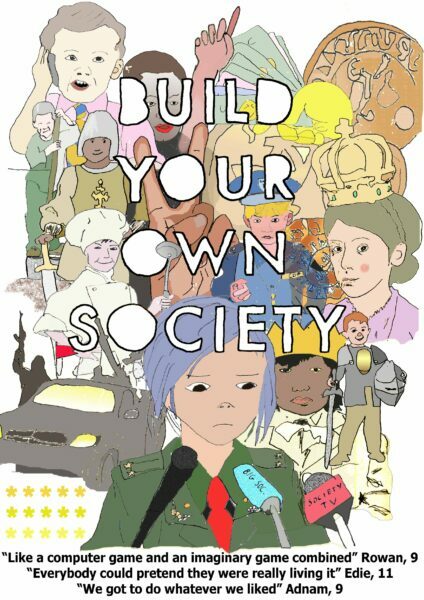 As well as being a great way to diversify your SMSC provision, Build Your Own Society is an incredibly powerful and memorable experience for everyone who participates. Children absolutely love it, and it has been booked for children’s parties and festivals as well as for schools. Preeminent play theorist Bob Hughes defines ‘social play’ as ‘play during which the rules and criteria for social engagement and interaction can be revealed, explored and amended.’ Build Your Own Society is the only workshop on the market that allows children to take up the key SMSC concepts and explore them though dramatic make-believe play. We don’t just talk about ‘Values’, we enact them (or fail to enact them) and then witness the repercussions. A child’s capacity to understand abstract concepts is typically lower than an adult’s, but as soon as the talk stops and play starts, the gap closes. Play is the only way for children to develop a critical perspective of society, criminality, morality, law, and many other important SMSC learning areas. Build Your Own Society gets children playing a free-form game that they are already familiar with (see Bob Hughes 2011 on socio-dramatic play). The facilitators role is merely to highlight learning opportunities and make space for the students to reflect on issues raised while they were having fun. > Pupils will develop their self-knowledge, self-esteem and self-confidence. > Pupils will discover that skills that they already possess can empower them to participate in democratic processes, civic life, discussions of right and wrong, and even political careers. > Pupils become more confident and articulate when distinguishing right from wrong. > Pupils are encouraged to take responsibility for their behaviour. > Pupils learn about the function of the law, the government, and many other social institutions. > Pupils better understand how they can contribute positively to the lives of those in their communities around the school and to society more widely. > Pupils are able to reflect on the importance of demonstrating respect for their fellow citizens. > Pupils learn respect for democracy by actually participating in a democratic process. > Pupils better understand the educational power of play and the difference between games and reality.